Do you want to shorten recovery time, increase stamina, decrease stress, sharpen your focus, and improve your athletic performance? Take a deep breath and read on! As athletes, the importance of breathing is often overlooked. After all, everyone breathes all day every day, so why think about it? This blog post will explore some breathing techniques to help elevate performance, discuss the benefits that one can obtain by using those techniques and how massage can participate in more efficient breathing. Recent studies have shown diaphragmatic and nasal breathing techniques could improve athletic performance. Diaphragmatic breathing may increase the antioxidant defense status in athletes after exhaustive exercise , activate the parasympathetic nervous system to calm nerves, decrease stress and muscle tension , sharpen focus, reduce fatigue, and promote stamina . Nasal breathing on the other hand allows the body to take in and process oxygen 20% more efficiently during exercise and protects the lungs from cold and polluted air.For athletes specifically, these two techniques could increase physical performance, focus, mental performance and shorten recovery time . In the video below we will teach you these two techniques so you can improve your breathing and athletic performance. So where does massage come into play when it comes to breathing? Most people know that the lungs allow us to breathe but don’t usually think about the muscles that allow the lungs to function. The diaphragm is the main muscle that allows humans to inhale (inspiratory) and the abdominal muscles primarily allow humans to exhale (expiratory). 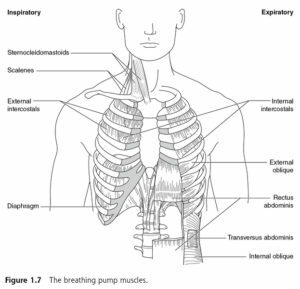 A number of smaller muscles also assist in breathing as seen in the diagram below. Any restrictions we have in these muscles can impede breathing and thus harm athletic performance and recovery. Asking your massage therapist to incorporate techniques that target these muscles in your sessions can help to remove those restrictions and allow more effective and efficient breathing for improved performance. Want more information on massage for the diaphragm and abdominal muscles? Click here to read "Self Care for the Abdominals and the Diaphragm"
Click here to read "Untying the Stomach Knots with Self Abdominal Massage"